After writing up my review for "Blanket statement" I was inspired to have a play with some of the felt scraps in my stash. 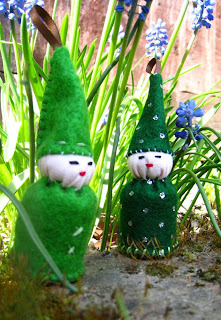 Because of being drawn to small projects at the moment the pattern for the tiny gnome took my fancy and these two little mischievous guys were made before I quite realised it. The pattern called for small circles of pink knit fabric and as I only had a normal bit of cotton I had to go with that, though they did end up looking a bit wrinkly. My little garden elves also have a little bit of lavender stuffed in their bodies, just in case their future owners want an excuse to have them around after the Christmas trees get packed back up next year. Surprisingly I still had a little spare time to have a go at another of the projects that was calling me from this beautiful book. 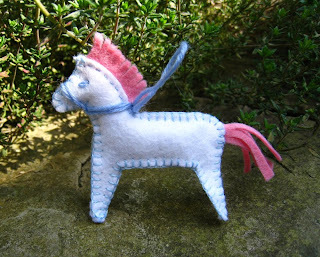 This time I pulled out a bit of white felt and made up the pretty little pony. I'm very pleased with how he came out - so tiny and so much detail but somehow still neat and even. 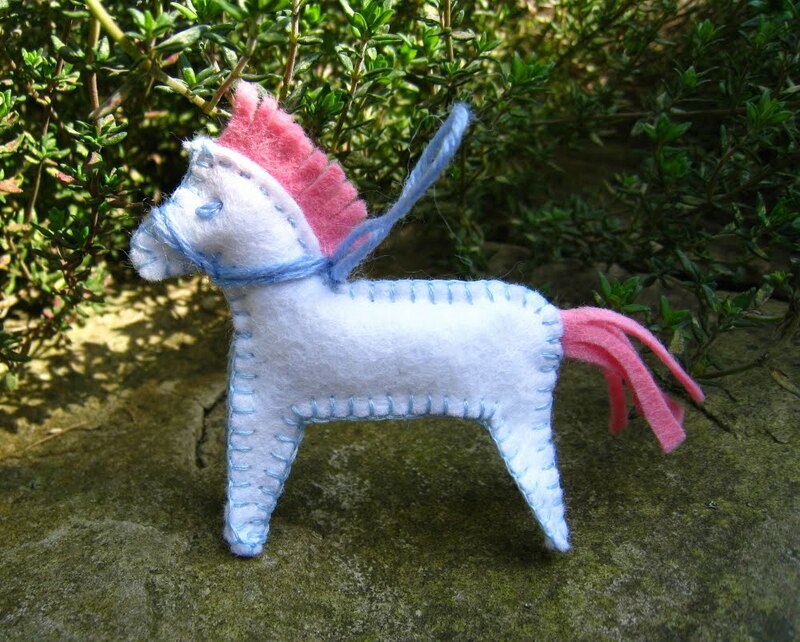 Again this little pony would be a pretty addition to a Christmas tree but I'm tempted to pass him on to one of the little girls in my family as I think he would be most loved that way. These three little ones took me only three days to complete which is astounding. Usually it takes me a good week to see an item from start to finish so while doing these it felt like I had time on my side for a change. The patterns and instructions were very easy to follow and now I really can't wait to get started on another project from this book soon. That's another three items tucked into the Christmas box, hooray! Hopefully with a few more successful little projects like this I'll be much closer to have next Christmas under control. VERY CUTE !!!! I love working with wool ..... I'll have to look for that book. .....and thanks so much for visiting me on my blog! I love your little gnomes! I've been tempted to crochet (amigurumi) something similar. Is it a bird, is it a plane?..